Lawrenceville Family Dental Care in Gwinnett County is the dental practice to trust for dental implant restorations. Touted as the most advanced dental restoration of all time, dental implants can completely restore a person's smile to full health and beauty. Dental implants provide a permanent solution to the replacement of missing teeth, and they securely fit inside the mouth with a truly natural appearance. While dental implants are permanent replacement teeth, they will suffer normal wear and tear over time just like natural teeth. Occasionally dental implants will need to be tightened or the crown of the tooth will need to be replaced. Dr. Ashish Patel of Lawrenceville Family Dental Care is committed to providing the highest quality dental restorations in Gwinnett County. His expertise and care are priorities of the entire practice because he understands how personal your smile is to you. At Lawrenceville Family Dental Care, we are passionate about creating and maintaining the smile that you wear. Call to learn more about dental implant restorations. Like all parts of a working machine, some parts last longer than others. Implant repairs are often needed just like typical dental repairs for the natural teeth. While dental implants are "permanent solutions" to the replacement of missing teeth, they are not invincible from damage. They can crack, chip, or be knocked out just like natural teeth can. Dr. Patel of Lawrenceville Family Dental Care understands that any damage to the mouth can cause stress. 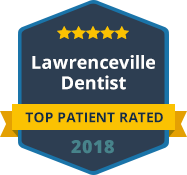 However, at Lawrenceville Family Dental Care we are here to provide the most compassionate and comprehensive dental care for all patients. If you need dental implant repairs in Gwinnett County, contact Dr. Ashish Patel at Lawrenceville Family Dental Care. Our entire staff is dedicated to helping you achieve and maintain a complete, healthy, beautiful smile.